Such is the speed of China’s energy transition that it’s hard for plans to keep up. The country’s new five-year plan for the energy sector, released yesterday, set targets that would have been celebrated as groundbreaking just a couple of years ago, but now seem positively quaint. Coal consumption will be limited below its peak level in 2013-2014 as clean energy share will reach 15%. And preliminary data shows that China kept exceeding those targets and busting records in 2016. On the renewable energy front, in 2015, China set the world record for most solar power capacity installed in one year, adding enough solar panels to cover one and a half football pitches every hour of the year, day and night. But it was only getting started. In 2016, the country proceeded to smash that record, doubling installations to three football pitches per hour. The 2020 solar power capacity installation target is likely to be met next year, two years ahead of schedule – a pretty impressive feat given that the target was set only a couple of months ago. Coal consumption has been falling for the past three years, with recent data showing a drop of 1.6% in Jan-Nov 2016, despite heavy industry recovery. This means that the target for limiting coal consumption should be easy to achieve, though it does provide a backstop against an unexpected rebound and represents official recognition that growth in coal use is over. In March, China announced a total energy consumption target of 5 billion tonnes coal equivalent in 2020, implying 3% annual growth from 2015. While the new energy plan itself stuck to the target announced earlier, statements from officials suggested that they project around 2.5% growth instead of the 3% growth rate implied by the target. This projected 2.5% growth, together with limiting the share of coal in the total energy mix to 58%, means that coal consumption in 2020 cannot exceed its peak level in 2013-2014. Both growth rates seem very high though, given that consumption only grew 0.9% in 2015, and the government estimated in December that 2016 would see 1.4% growth. The latest stats suggest that CO2 emissions likely stayed flat as non-fossil energy grew aggressively. Slower-than-projected energy demand growth means that the planned amount of renewable energy generation will cover much more of the demand. If China delivers the planned amount of renewable energy, but overall energy consumption growth is slower, the share of non-fossil energy could approach 17% in 2020, well above the targeted 15%. These numbers might not sound impressive on the surface, but they imply that China will be getting well above one third of its total power demand from non-fossil energy. Another positive indication from earlier energy plans is that all targets are now worded as minimum targets – “more than 15% non-fossil energy”, share of coal “less than 58%” etc – implying that there is some recognition that the transition is likely to happen much faster than the targets indicate. As a result of lower total energy demand and higher share of clean energy, CO2 emissions will also be much lower than implied by the target. A big challenge is making space for the vast amounts of under construction and planned renewable energy capacity into the grid. The grid operator and power companies often fail to cut power generation from coal when generation from renewable sources increases, and don’t prioritise renewable energy in grid planning and operation, leading to massive waste of clean energy and slower growth in the use of renewable energy. 19% of wind power output and 10% of solar power output was wasted in in Jan-Sep 2016, making the wasted clean power equal to power generation from 20 large coal-fired power plants. Clean energy output is growing fast, but not as fast as it should given the amount of new capacity being added. 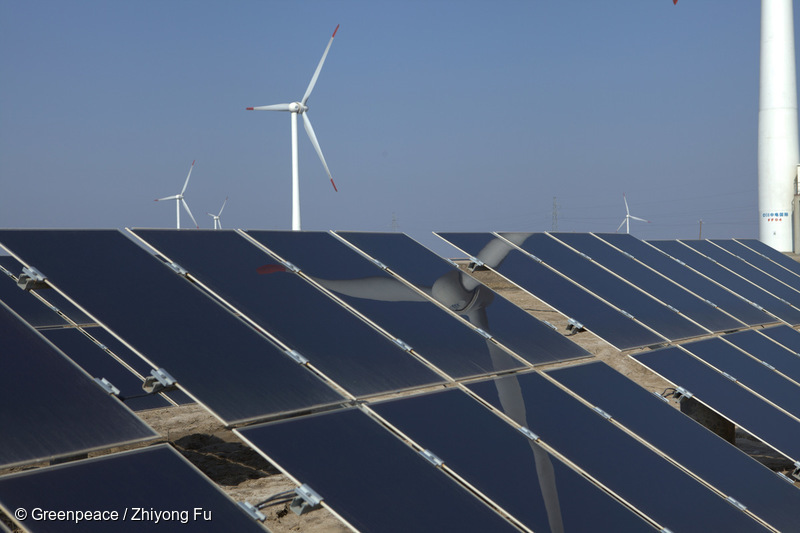 The flipside of the coin is that there is major unused potential for power generation in China’s existing wind and solar capacity that will be unleashed once the problems are resolved. Speaking of which, one disappointment in the five-year plan is that there is no hard, measurable target for reducing the waste of clean electricity. In China, exact and measurable targets are particularly important, and reluctance to set them signals either lack of confidence in resolving the problem by 2020 or disagreements within the government. Most of the discarded wind and solar output is in the far west of China. Massive new transmission links are being built to these regions which could help in resolving the problem, but only if the operation and management of these lines is tailored for wind and solar rather than for coal-fired power. Problems in grid integration also led central planners to prioritize wind and solar development in the eastern and central parts of the country, instead of the west. Basically, China is in the middle of a complicated, messy and rapid transition from coal to clean energy, with all setbacks and challenges that comes with it.